The Canon EOS Rebel T6i (known as the EOS 750D outside the US) was until only recently Canon's key entry-level DSLR, taking the fight to the likes of the Nikon D3300 and D5600. Despite the step up to a 24.2MP sensor from the 18MP EOS Rebel T5i / EOS 700D, the EOS Rebel T6i / EOS 750D keeps the older sensor's native sensitivity range of ISO100-12,800. There's also an expansion setting of ISO25,600 for very low light conditions. In movie shooting the maximum native setting is ISO6400 and there's an expansion value of ISO12,800. 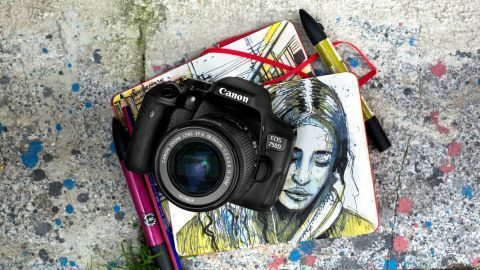 In a first for Canon DSLRs, the OS Rebel T6i / EOS 750D features both Wi-Fi and NFC (Near Field Communication) technology to enable it to be connected to a smartphone or tablet for remote control and image sharing. It's even possible to connect two cameras just by touching the NFC logos together, and then transfer images wirelessly. Like the older Rebel T5i / 700D, the OS Rebel T6i / EOS 750D has a 3.0-inch 1,040,000-dot Clear View II TFT screen that's touch-sensitive. It also has an aspect ratio of 3:2 to match the uncropped ratio of the imaging sensor, while the vari-angle hinge on the side of the body means it can be placed in a range of positions - handy when you want to shoot low to the ground or overhead. There's a 19-point phase-detect AF system when shooting through the viewfinder. The choice of AF point can be left to the camera to decide in 19-point AF mode, or it can be set manually in Single point AF or Zone AF mode. In Zone AF mode you have the choice of five groups of points for selection, whereas in Single point mode all 19 points are available for individual selection. Canon's Hybrid CMOS AF III system (with Face detection, Tracking AF, FlexiZone-Multi and FlexiZone-Single modes) is available with the Rebel T6i / 750D when using Live View. This is an improved version of the Hybrid CMOS AF II system found in the Canon EOS Rebel SL1 / EOS 100D, having a greater number of focusing pixels arranged in a more regular array than in the past. Canon says it's about 4x faster than version II and two generations ahead of the original Hybrid CMOS AF system in the Rebel T5i. Unlike the Rebel T6s / 760D, the EOS Rebel T6i / EOS 750D doesn't have a Servo autofocus option in Live View mode so there isn't an option for focus to adjust continuously while the shutter release is held down and subject distance changes. There is, however, a Continuous AF option in the Live View section of the main menu. When this is activated focus is adjusted fairly slowly when the shutter release isn't pressed. It's designed for use in video mode and to pre-focus when shooting stills.